One roll of reg. 2" W silver duct tape. One 4 mm Allen wrench. Two [moving blankets] to wrap the arms. Two pieces of cardboard, ea.11" W x 36" L.
If you're moving your futon sofabed any distance, first unzip your decorative cover. Taking off the cover avoids dirt and tears. 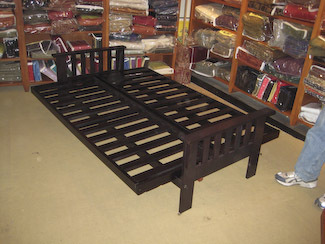 To safeguard your futon mattress, Bedworks offers a moving kit that includes two long cotton futon ties and a large plastic futon mattress bag for 10 dollars. 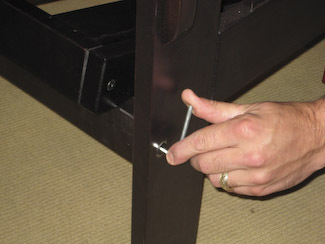 An allen wrench is key to keeping your futon frame tight and in excellent shape. It's also key to taking it apart when moving. If your original Allen wrench is gone and you're still in Boston, visit Bedworks for a free replacement. If you live further away, visit your local hardware store. A 4mm Allen wrench costs about 25 cents. Use the 4 mm Allen wrench to loosen and remove the two bolts in each arm. That's four bolts total, plus the four cylindrical "barrel nuts" they thread into. If the barrel nuts don't fall out, just rap the ends of the two long "stretchers" once or twice. Use the pliers to pull out the eight dowels that help connect the arms to the stretchers. Next comes the large slatted futon deck. It disassembles into two half-decks. Where the two half-decks pivot on each side in the middle, you'll find two black cylindrical steel "clevis pins" [3/8" dia. head] that hold them together, one at each end of the deck. From underneath the slat inside, pull out the curly wire "cotter pins" which allows each 2 1/4" long "clevis pin" to fall out. Don't disassemble anything else: it won't get hurt moving. It's safer, faster, and easier to leave the other hardware attached right where it is, rather than risk losing it in the move. So don't take off the white plastic rollers, the 6" long bubinga hardwood "kickers," or the steel hardware that holds them in place. 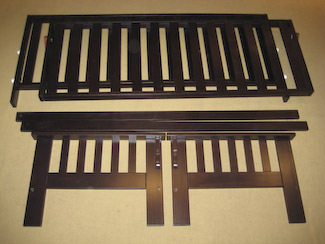 And ignore the eight black steel screws that hold the 26" and 31.5" long beech end caps onto the slatted decks. They're all safe where they are. 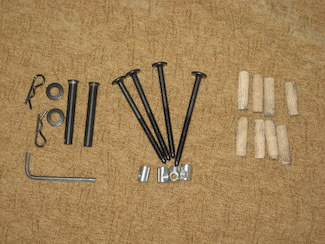 Place all 17 pieces of loose hardware [8 wooden dowels, 4 bolts, 4 barrel nuts, and 1 Allen wrench] in the upper, longer roller slot in one of the arms. 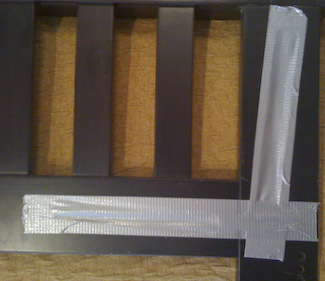 Tape them safely inside the slot with a 13" piece of the silver duct tape. Lay the arms together, inside-to-inside. Tightly tape their front legs together, then their back legs. Finally wrap the pair of arms in an old "moving" blanket. Duct tape the two long slender beech "stretchers" top & bottom onto the two slat decks' front edges, as edge protection. Put their inside [barrel-nut hole side] outermost. Now nothing important can get scratched. Next, take the two cardboard pcs. 11"W x 36"L. Crease them length-ways into two "U"-shaped "shoes" with 4" H sides and 3" W bottoms. Stand each deck upright in a "shoe." Tape each shoe tightly onto each slatted deck by passing the duct tape over the lower-most deck slat. Now you only have 4 pieces to move, one plastic-wrapped futon mattress, one set of arms [w/ hardware taped inside] and two stretcher/deck sets in cardboard shoes that stand on end for moving. Best wishes for a great move! "Bought a bed upstairs in 1980. Still holding strong. Love your products."